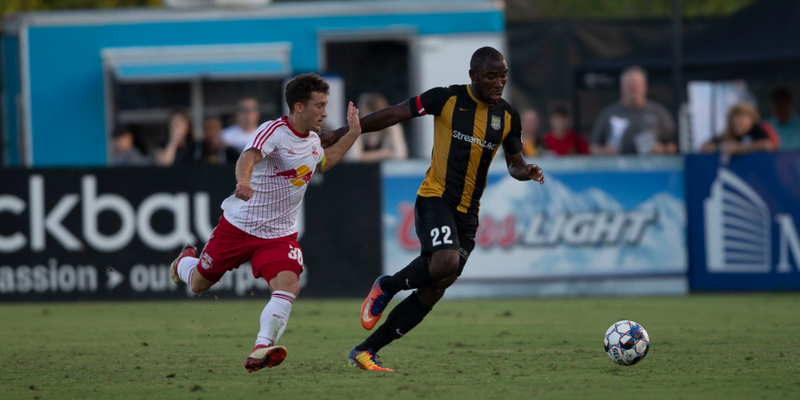 After being reduced to 10 men in the 61st minute, the Charleston Battery earned a 4-4 draw with New York Red Bulls II Saturday night at MUSC Health Stadium. After being pinned back in their own defensive third for much of the time following the red card, the Battery earned a corner kick in the 75th minute. Vincenzo Candela served an inswinging corner towards the back post and Okonkwo headed it down past Evan Louro to put the Battery back in front. Barlow completed his hat-trick in the 88th minute to pull the visitors level again. Barlow rose up and flicked a header from a right-footed cross from the left side that beat Joe Kuzminsky at the near post to make it 4-4. As injury time wound down, Angelo Kelly scored for the Battery. The ball bounced around the six yard box before Kelly flicked a back heel on frame, forcing Louro to parry it back into the chaos. Kelly finished his own rebound and appeared to put the Battery ahead 5-4, but the referee blew for full time and left the field immediately. The game ended in a 4-4 draw. Following the draw with New York, the Battery will head out on the road to take on Louisville City FC at Slugger Field on Friday, August 31.